As one of Canada's most profitable retail chains and as the largest supplier of office supplies to small businesses and home office workers, Staples has become increasingly popular with residential consumers as well. Shop new deals every day at the Staples Deals Centre! Save $80 on Whalen Greenwich Computer Desk & Hutch Now $239.99. Was $319.99. Save 21% on R-Kive Heavy-Duty Storage Box for Now $19.99. Was $25.49. Save $56 on a Fire and Water Resistant Digital Safe! Now $182.99. Was $238.99. Save $20 on a Amplifi AC1200 High-Gain Wi-Fi Router. Now $59.99. Was $79.99. Save $70 on a VivoBook Max Laptop! Now $699.99. Was $769.99. Save $200 on a Pavilion All-in-One Desktop PC Was $1399.99 value for $1199.99. Save $200 on Acer Predator Gaming desktop for $1399.99, Was $1601.09. Save $200 on Acer Nitro Gaming desktop for $1199.99, Was $1401.09. Save $30 on Ultimate Ears Wonderboom Now $99.99. Was $129.99. Save $30 on Logitech Prodigy G231 Gaming Headset for $69.99, Was $100.24. Save $25 on a Back-UPSTM 650VA Battery Backup, 7-Outlet Now $84.99, Was $109.99. Save $70 on Asus C423NA Chromebook Now $429.99. Was $500.89. 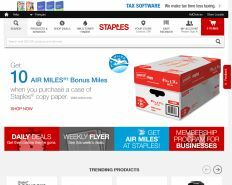 Save $170 on Acer Aspire 5 Laptop for $599.99, Was $770.89. Get $20 off your entire order of $200 or more. Online only. Save $50 on LG 22-inch 75Hz LED Gaming Monitor for $99.99, Was $155.49. Save $20 on a Royal Sovereign Electric Bill Counter $220.99 value for $295.99. Save $60 on a VELOP Whole Home Mesh Wi-Fi System, 3/Pack! Now $299.99. Was $359.99. Save $100 on Osgood Leather Manager’s Chair for $149.99, Was $249.99. Get $50 off Wireless Inkjet 4-in-1 printer for $49.99. Was $99.99. Save up to 70% during the Dollar Deals.